When you see a sudden shift in the buck's travel direction, stop. There's a better than 50 percent chance the buck is watching you now. 1. 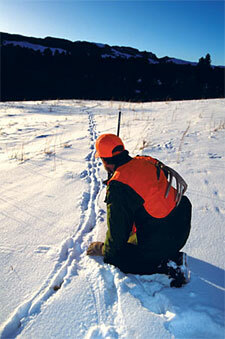 Look for remote areas with relatively little hunting pressure. The more roadless and remote, the better. If you found good buck sign in years past, odds are good the deer will be there again in subsequent seasons. 2. Be able to recognize a big buck's track. It will be 4 inches or longer. An even better indication is width. A track that is 3 ½ inches or more across is the one you want to follow. 3. After locating a track, ask yourself: When did it last snow? How long has the snow been on the ground? How cold has it been? Did it warm up today and melt out part of the track? What type of snow is on the ground — wet, powder or granular? Do the tracks look like they were made in soft and wet or dry, frozen snow? Some of this will only come with experience, but you can always compare deer tracks with your own boot prints to see how they differ. 4. Don't watch your feet. Plan six or seven steps; look up and then walk. Set each step down slowly and quietly. Try to feel for twigs that might snap under your weight. 5. Don't expect to find your deer standing in the open. Look for parts of a deer, like a patch of brown or the tell-tale horizontal line of its back or belly. Pack binoculars and USE them. 6. Move as fast as the tracks afford you. Move slow when following fresh tracks. You can move faster when following older tracks. 7. 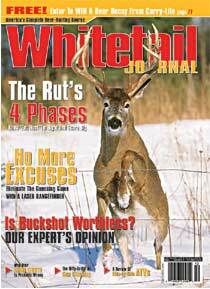 Know the phase of the rut. Outside of the rut, an old buck's primary objective is security. That means thick cover. 8. Wind direction. Wind direction is just as important here as when stand hunting, perhaps more so. If and whenever possible you should work into the wind. 9. When you see a sudden shift in the buck's travel direction, stop. There's a better than 50 percent chance the buck is watching you now. Scan every square inch of cover. Then scan it again. Look all around, even behind you. 10. Most of your shots will be snap shots at moving deer. Most often running deer, and often at very close range. For those reasons, the deer tracker's weapon of choice is a repeating rifle. Most prefer a semi-auto or pump, but with experience you can work a bolt as quickly as a pump. 11. No matter what you do, you're gonna make mistakes. The difference maker is how you react when you bump a deer. Stop. Relax. Be patient.